America has always been hooked on self-protection. Citizens are encouraged (and protected by law) to bear arms and stand their ground against perceived intruders. When a racist country is that obsessed with self-defense, the safety of men with white privilege — even those who, like George Zimmerman, have a record of abuse — takes precedence over the welfare of everyone else. 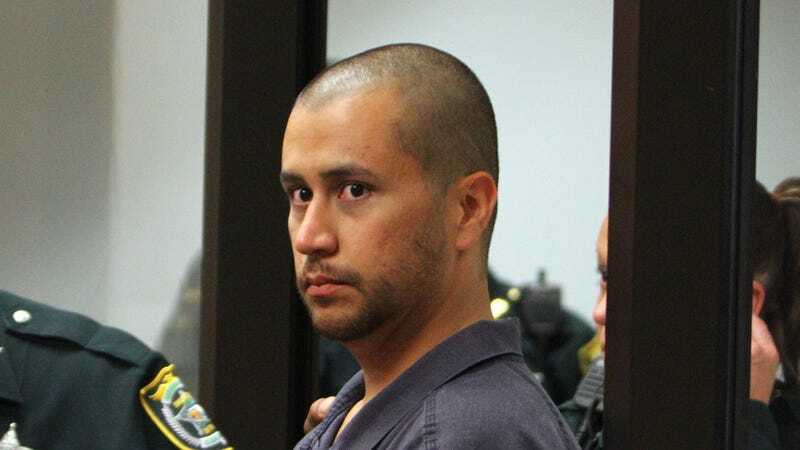 The six-woman jury (five white, one hispanic) that acquitted George Zimmerman of second-degree murder in the death of Trayvon Martin, a black teenager armed only with candy, never learned that Zimmerman had a long history of violence against women. Zimmerman allegedly molested his female cousin for ten years, starting when she was just ten years old. Zimmerman's former fiancé sought a restraining order against him for domestic violence; she alleged (alongside other more violent claims) that Zimmerman was "trolling her neighborhood to check on her." These two pieces of character evidence were deemed irrelevant, even though the latter suggests that he had a thing for "checking up" on people who didn't want or need to be monitored and therefore seems particularly apropos. Imagine if the races were reversed: what if Martin's cousin had accused him of molesting her, or if a former girlfriend said he pushed and slapped her? Given that the jury was informed that Martin had marijuana in his system when he was shot and killed — you know, the demon weed that turns Skittles-wielding teenagers into murderous sociopaths — we'd venture to guess that they'd hear about his past treatment of women, too. We don't need a topical hypothetical for switching genders, because a Florida woman with a clean record who fired warning shots against her allegedly abusive husband was recently sentenced to 20 years in prison for attempted murder. The court's decision to ignore Zimmerman's pattern of violence reveals "a system of power that dismisses the experiences and voices of survivors of sexual assault and domestic violence as invisible and untrustworthy," writes Salamishah Tillet at The Nation. We'll go one step further: it reveals a system of power that prioritizes the experiences and voices of men who are "just trying to protect themselves" without exploring the reasons why they're so paranoid in the first place. We witnessed the same hypocrisy during the Oscar Grant case, which was incredibly similar to Martin's: the defense attorney for the BART officer that fatally shot the young black man in the back said he was entitled to show evidence that "Grant is the sort of person or had the sort of character that would lead him to" resist arrest, even though he wasn't armed or doing so at the time. The former BART officer, Johannes Mehserle, publicly apologized for his mistake, and a jury deemed that he had learned his lesson; he ended up serving only eleven months in prison. This was evidenced today in The Washington Post, when Richard Cohen argued that it's logical to be afraid of young black men because "young black males commit a disproportionate amount of crime." Basically, black people are responsible for ending racism, and while they figure that out — "the problems of the black underclass" will be solved "someday," Cohen says, admitting he doesn't know how — white people are responsible for protecting themselves. Meanwhile: a Milwaukee senior citizen was charged with fatally shooting his 13-year-old neighbor. The older men suspected the young one of stealing guns from his home; he shot the kid while he was taking out the trash, while his mother stood just a few feet away. Guess which one was white and which one was black?